Who invented the Hot Comb? The name of the person credited with inventing the Hot Comb is Francois Marcel Grateau (1852 - 1936). Francois Marcel Grateau is not only famous as the French inventor of the Hot Comb and heating irons but also as a hair stylist and businessman. When was the Hot Comb invented? Francois Marcel Grateau invented the Hot Comb in 1872, during the Second US Industrial Revolution / Victorian period of invention (1850 - 1914). Definition of the Hot Comb: The Hot Comb, also known as a straightening comb or hair straightener,, is defined as a heated metal comb that is used to straighten moderate or coarse hair from the roots creating a smoother hair texture and different hairstyle. Fact 1: Who invented the Hot Comb? The Hot Comb was invented by Francois Marcel Grateau in 1872 during the Second US Industrial Revolution era of inventions (1850 - 1914). Fact 2: Who invented the Hot Comb? The means to curling hair dates back to Ancient Rome when the Romans used the calamistrum curling iron which was heated and used to create curly hair styles for men and women. Fact 3: Who invented the Hot Comb? During the Middle Ages and the Renaissance period women traditionally wore their hair long, loose as a young girl and then pulled back, plaited or braided. The 1700's witnessed the fashion of wearing extravagantly decorated white-powdered wigs. Fact 4: Who invented the Hot Comb? During the puritanical Victorian Era (1850 - 1914) women wore demure, hairstyles using oil to smooth their long hair over the temples with long 'sausage curls' or ringlets at the sides with heavy knots of curls at the back. Girls and women commonly used hair rags to create their curls. Using a wet comb wisps of hair were wound tightly on pieces of rag. The hair rags were left in overnight and pulled out in the morning to create the desired curls. Fact 5: Who invented the Hot Comb? Archaeological discoveries in Egypt in the late 1800s provided inspiration for new fashions, jewelry and hairstyles that were once worn by Ancient Egyptian women. A French hair stylist called Francois Marcel Grateau invented a hot comb in his Paris salon to re-create a fine straight look reflecting the hairstyles of famous Ancient Egyptian women. Fact 6: Who invented the Hot Comb? The inventor of the Hot Comb, Francois Marcel Grateau, was born on October 17, 1852 in Paris, France and died on June 15, 1936. Fact 6: Who invented the Hot Comb? Following his education he began working in the salons of Paris that were frequented by ladies of dubious professions and attained the skills of a hair stylist. Fact 7: Who invented the Hot Comb? The ambitious Francois Marcel Grateau opened his own Salon in Paris and was determined to make it the most fashionable place to go and to ultimately attract high profile and high paying women. Fact 8: Who invented the Hot Comb? Francois Marcel Grateau achieved his ambition due to his invention of the Hot Comb in 1872. The young hairstylist was well aware of the growing interest in all things Egyptian and wanted to create a woman's hairstyle with waves and curls reflecting those worn in antiquity. Fact 9: Who invented the Hot Comb? 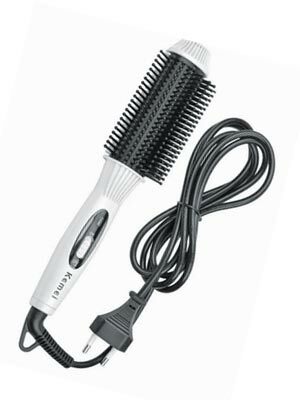 His Curling-iron tool, that would later become known as the Hot Comb, was used to straighten and curl hair. Fact 10: Who invented the Hot Comb? The "curling iron " consisted of heavy tongs with rounded internal surfaces, in which one of the tongs had a circular convex section and the other tong a concave one, so that one fitted into the other. Fact 11: Who invented the Hot Comb? The tongs were then heated over gas burners and then closed over the hair allowing it to be straightened, curled or waved. Marcel Grateau commissioned L. Pelleray of Paris with manufacturing the heated irons in the 1870s and they were exported across the world. Fact 12: Who invented the Hot Comb? Marcel Grateau's invention became a great success and allowed to develop new hairstyles including one that was named after him called "the Marcel wave". Fact 13: Who invented the Hot Comb? "Marcelling" became all the rage in Paris and Grateau's salon became one of the most successful salons in France. The Marcel Grateau "curling iron" could only be used by trained stylists due to the danger of heating the tongs over gas burners and women flocked to his salon to have the new a stylish wave as another option to curls. Fact 14: Who invented the Hot Comb? The long-lasting "Marcel wave" stayed in fashion for nearly 50 years and he patented his Hair-waving iron on September 3, 1918, patent number US 1277739. Francois Marcel Grateau died on June 15, 1936 an extremely wealthy man. Fact 15: Who invented the Hot Comb? Other inventors went on to invent new, safer versions of hot combs that could be used at home. Fact 16: Who invented the Hot Comb? To avoid the cost of having their hair straightened at a salon women began to use clothes irons to straighten the hair. Many women used electric irons to straighten their hair right up to the 1960's. Fact 17: Who invented the Hot Comb? The famous Black American entrepreneur Madam C.J. Walker invented a line of African-American hair care products in 1905 including the world's first hair-straightening formula - but contrary to popular belief she did not invent the hot comb. Fact 18: Who invented the Hot Comb? The Black American inventor Walter Sammons of Philadelphia, Pennsylvania received U.S. patent number 1,362,823 on December 21, 1920 for an improved hot comb that straightened hair. Fact 19: Who invented the Hot Comb? The improved Hot Comb invented by Walter Sammons had a thermometer housed in the tongs that extended into the handle so that the user would know how hot the comb had become. The handles were also insulated to prevent heat being conducted and burning the user. Fact 20: Who invented the Hot Comb? An electric Hot Comb, called 'Whites Electric comb' was developed in 1926 by Whites Manufacturing Company in England. Fact 21: Who invented the Hot Comb? Improvements to various hot comb designs continued over the years. Hot combs and hair straighteners are still popular today with the latest designs having digital temperatures and automatic cut offs. Who Invented the Hot Comb - Francois Marcel Grateau - Inventor - Invention - Hot Comb Definition - Meaning - Famous - Important - History - Timeline - Innovation - Significant - Development - Household Items - First - Definition - Kids - Facts - Information - Info - Who invented the Hot Comb - Dates - When - Why - Impact - Purpose - Use - New - Old - Amazing - Best - Definition - Meaning - Awesome - Cool - French - Hot Comb History - Timeline - Who Invented the Hot Comb?